He is just a boy, but he has proven his worth as a shepherd tending to his family's flock of sheep. Each night he drives the flock to the same place upon a hill near his home. It is a significant place as it provides nourishment as well as protection for the sheep. He is small in stature, so he must climb upon a rock to overlook his herd. Nonetheless, he enjoys the night. The flock has several newborns, but there is one that is exceptionally small. So each night he climbs upon the rock with the little lamb and sits watching while stroking the soft gentle wool. It's a mutual friendship as he protects the lamb and the lamb provides the much needed warmth upon the cool nights. Every so often he must stand and count the herd to make sure none have gone astray. Once he assures himself that all the sheep are in order, he sits back down and continues caressing the little lamb all the while watching the flock below. He looks up to gaze and wonder about all the brightly lit stars above. He has heard many stories about the stars and why they are only seen at night. Nonetheless the night always brings a sense of peace for him. In the silence of the nighttime he sees a peculiar star. Amongst the vast array of stars that shine so bright, he finds one that is brighter then all the rest. In admiration, he continues to stare at the star while in curiosity of it's size. As he watches in bewilderment, the star continues to grow brighter and brighter to the point that it lights the hills upon which he and the other shepherds stand. Fear takes hold of his heart as he has never seen such a display. Night has turned to day and he is about to run the sheep down the hill, but he is frozen in his tracks. While he holds the little lamb he sees the heavens open. He can not look away, for if he looks away he will miss this marvelous event. "Do not be afraid... for behold I bring you good news of great joy which will come to all people... for to you is born this day in the city of David a Savior, which is Christ the Lord. And this will be a sign for you... you will find a babe wrapped in swaddling cloths and lying in a manger." He was shocked at what he just saw. But he had heard the older generation sharing stories of a prophet who was coming. Could this be the prophet? "Glory To God in the highest... and on earth peace among men with whom he is pleased..."
Within a moment, the angels had disappeared. All that remained was the brilliant glow of the star. He knew in his heart that he had to follow that star and see this great wonder that the angels had spoke of. With the littlest lamb upon his shoulders, he gathered his flock and followed his fellow shepherds to a town called Bethlehem. He had never seen a manger so alive. It was as if the star above had shown down through the building and casts it's warm glow upon those below. Once inside he saw a baby wrapped in swaddling cloths, lying in a manger that was filled with straw. The sight was so grand that he had dropped on to his knees. For a moment he could not keep his eyes off the child. But when he finally was able to look away, he saw that even his sheep had honored the child by kneeling down on their knees. The littlest lamb was not his to giveaway, but it was the least that he could do. With the gift of his favorite lamb, he took his leave. Upon exiting the manger his heart was filled with joy, hope and something far more greater than he could explain. "The Saviour is born! The Saviour is born!" Another town, another city, it didn't matter to him. This was his favorite time of the year. He can not believe that it has been two decades since he began sharing the great joy that fills his heart at this time of the year. It is Christmas and like so long ago, he feels like the shepherds that ran through the streets of Bethlehem while shouting the news of Jesus' birth, as he graces another stage to sing songs about Christmas. "Our church... our Pastor Fred Rowell asked... 'cause he knew I sang and I was playing clubs in Athens, Georgia. He asked if I would sing, if we'd do a little Christmas thing at the church, Christmas week." shares Country Singer John Berry. "So Robin [his wife] and I and our sister-in-law Tracy... who has just a beautiful voice... and the church pianist, we did a little Christmas special. 'O' Holy Night' was the hit of the night, of course. Everybody loved it. But the fact that Fred had invited me... the church had about came unglued. At first off they were a little put off that this singer, this guy who sings around the bars at night, came and stole the heart of one of their life long girls. But now he's going to church there and now the Preacher has asked him to do a Christmas special! Well, sometimes people don't always know the heart of who they're talking about. But Fred saw something special, and he wanted to bring that to the church. It was just wonderful and we were such a huge hit! They asked us to do it the next year! So we did it in '89 and then in that year we asked my guys who played with me to come play with us and so it was a little bigger. Then the next year they'd opened a new church sanctuary. We had a guy playing the fiddle with us. Andy Carlson is not only a great fiddle player he's also an incredible violinist. He's actually first chair violin at the University symphony. He brought eight of his friends, violas and cellos and violins. Then it took on a whole new thing at the church! It was to die for... the next year we had three nights. So 1988, 1989, '90, '91... by '92 it was just really... it was three shows, a bigger string section... it was pretty incredible! Then I got my record deal. By Christmas of '93, 'Kiss Me In The Car' was on the radio and all that kind of stuff and we did the Christmas show and the church... you couldn't have gotten anybody else in there. I just really was huge." Thus began a journey that has turned into an annual celebration. "I am so blessed to be celebrating 20 years of our Christmas tour," shares John. "I have come to know and love so many people, venues and towns across America through this tour and I am grateful to have the opportunity to share the message of Christmas through music that means so very much to me." When you reach a milestone as of twenty years, one must commemorate the occasion with something special. John treats his fans with a new holiday album called Christmas. This album is a beautiful blend of new versions of traditional carols mixed with an amazing assortment of new songs. "The big thing was being sure that we had songs that were, that made for a good collection... that went well together over all." tells John. "Then also I wanted to be sure that we had not recorded them on other projects. 'Cause you know I've done so many daggone Christmas records, it's like Andy Williams or something! So I wanted to be careful that we hadn't over recorded some things." John designed the album as a mini Christmas show as it opens with a lively, canticle of hope in "Let Us Be." This song captures your attention with it's captivating chorus. The album continues with "This Christmas Night." Performed in as a beautiful modern gentle flowing melody, the lyrics speak of one's heart holding dear to the events of the nativity while celebrating a modern Christmas. John combines several renditions of his favorite carols as he adds Michael English's "Mary Did You Know," Josh Grobin's "You Raise Me Up," Michael Peterson's "My Heart Is Bethlehem" and a compelling version of the ever popular "Blue Christmas." "I'm really, really proud of our version of 'Blue Christmas.' It's so different." shares Berry. "When I first brought up recording that song, my wife about came unglued! She's the co-producer, she's like 'you're not recording that song!' And I said 'Why not?' She said 'It's horrible!' She said 'I don't care if it's been a huge hit or not...' The background vocals were you know... so many artists did that. They did these quirky, strange background vocal things like Elvis. I told the guys in the studio and my wife, we're all there at the session... I said 'listen I just think that all these recordings miss the mark on what the writer was trying say.' This is a sad song, it's really sad. I said 'Let's all go back to those 1972 singer/songwriter roots that we all share and let's do a James Taylor version of this song'... and that's what we came up with." This ever popular song contains a compassionate, moderate melody that is mixed with John's distinct melancholy vocals. Amongst the twelve beautiful songs on this album, there are two that stand out above the others. The first is a heartfelt, gentle song about love. John displays his songwriting skills as he co-wrote "I Don't Wanna Rush This Christmas." "I was with Jerry Salley and our other co-writer [Alex Dooley]... we were just sitting around talkin' and dropping ideas and it's a title that I had written down before, that was altered just a little bit. But it was about rushing Christmas." explains John. "...and some how we came up with the line I don't wanna rush this Christmas... and off we went! It was pretty fast and it came out really nice. The pulling teeth songwriting, I'm not a big fan of. The writing of a song that compares to being at a dentist... I've had some of those." Throughout the entire album John shares the message of hope by singing many songs about the real reason we celebrate Christmas as he sings about the birth of the Jesus Christ. None is more prevalent than with "Do Not Be Afraid." Mr. Berry performs this as an anthem while the lyrics proclaim the arrival of our savior. Both of these songs will certainly hit our list of Top Songs of 2016 while earning a nomination each in the Spirit Award's Song of The Year and Spirit of Christmas categories. This incredible spirit of Christmas album closes with a new rendition of one of John Berry's most iconic songs. The last time John recorded "O' Holy Night," was in 1994. 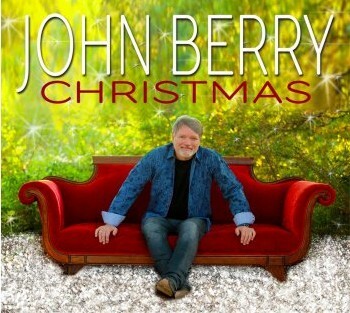 Mr. Berry sticks close to his original version of this timeless Christmas hymn. This album is like no other Christmas album. Through the years, I have heard holiday albums filled with the standard classics that are performed in a heartless and soulless manner. This album is certainly not like those. One can tell when listening to this album, that John Berry really put thought into it. Each song was carefully chosen to compliment the next and bring an over all proclamation of hope, joy and peace as you listen to it. "What Christmas is really all about... It's about Christ first, our relationship with him, our relationship with our family and our friends..." shares John on what he wants the listeners to get from his new Christmas album. "Peace... It's just the one thing you just can't buy. You can buy a lot of things but you can't buy peace. I just won't happen..."